I remember stopping once on a road trip to pick wild blackberries in the mountains of Washington. There just isn’t a more perfect treat than fresh fruit off the vine. We took those berries home to made jams and pies and of course froze some to enjoy later in the winter. 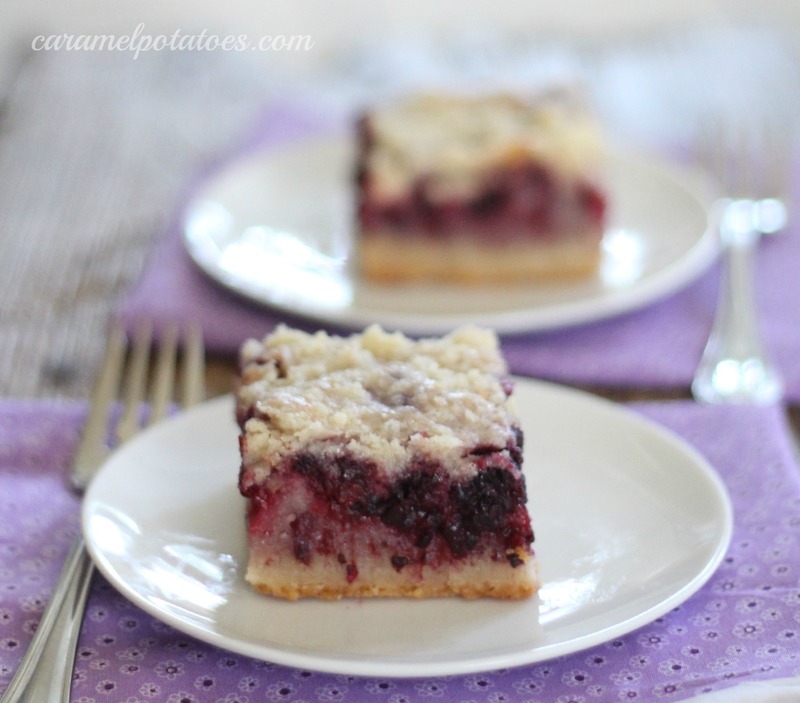 If you are one that has a fear of making pie crust, these blackberry pie bars are your perfect solution. I won’t say they taste just like a blackberry pie – it more like a crumble in a bar, but they certainly have that tantalizing taste of fresh blackberries, and are easy to make. There’s no need to roll out pastry- just press the dough in the bottom of your pan and pour on a fresh fruit filling. All that’s left is to sprinkle the topping and bake for an incredible berry treat. If you just can’t wait for the bars to cool enough to cut, go ahead – just spoon it out while it’s still warm and add a big scoop of ice cream! Who could blame you? Preheat the oven to 350°F. Grease a 9 by 13-inch baking pan with butter or cooking spray. Reserve 1½ cups of the crust mixture to use as the topping. Press the remaining mixture into the bottom of the pan. Bake the crust for 12 to 15 minutes until it is golden brown. Cool for at least 10 minutes. Whisk the eggs in a large bowl, then add the sugar, sour cream, flour, and salt. Gently fold in the blackberries. Spoon the mixture evenly over the crust. Sprinkle the reserved crust mixture evenly over the filling. Bake for 45 to 55 minutes, until the top is lightly browned. Cool at least 1 hour before cutting into bars. Tip: Defrosting berries may take longer than you think. 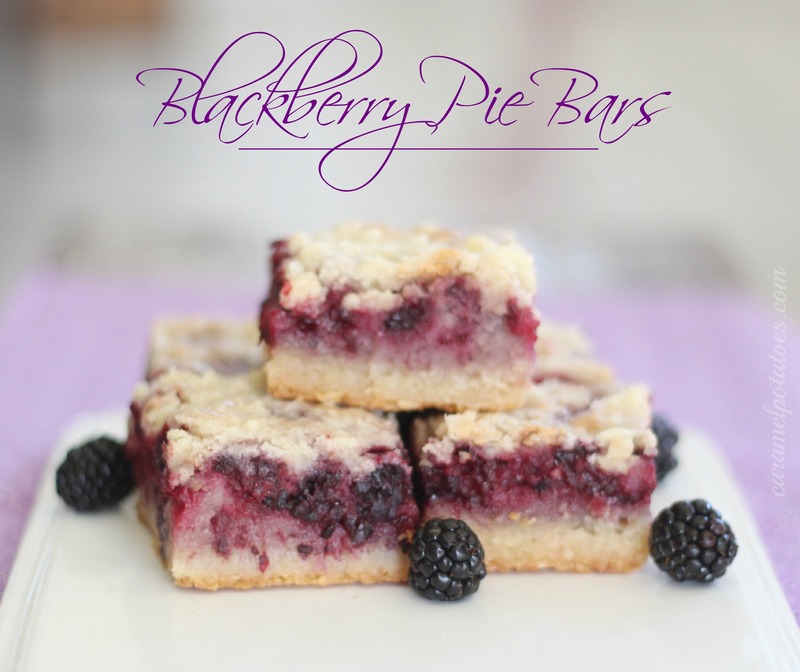 These bars come together in a hurry unless you need to wait a few hours for the berries to thaw and drain. Put the bags of berries into a plastic grocery bag so the thawed juice does not get all over the place and leave them in the refrigerator overnight. They’ll be thawed and ready to drain the next day. Thanks Kelly. I am so jealous that you can pick your own berries! Hope you love these bars. Wow. These look so good. I am one that doesn’t attempt pies . . . So these look perfect for me. Thanks! I have blackberries in my backyard. We always freeze them to make pies and cobblers. This recipe looks beautiful. I am anxious to try it and share it with my guests. Thanks. Fruit bars are complete heaven if you ask me! Thanks for sharing at Sweet & Savory Saturdays #24! Delicious.. I added 1/2 tsp vanilla to the filling. I did not stir the berries into the filling, instead I arranged the berries in a single layer over the crust and then poured the filling over it. I lined my pan with foil overlapping be sure to spray it. Affter they cooled, I chilled them then lifted the whole thing out of the pan and cut into bars. My coworkers raved about these. Cheryl – Thanks for the feedback – we love it when a recipe brings rave reviews!